This coming week, Microsoft will be at NAB Show 2019 in Las Vegas, bringing together an industry centered on deliver richer content experiences to audiences around the word. The media and entertainment industry will gather together for an in-depth view of the current, as well as the future of media technology and innovation, showcasing new and innovative cloud services to optimize and scale rich content experiences. Bringing the media industry to the cloud has a tremendous impact on the entire content workflow; from production, post, delivery and IT operations, cloud services enable companies to scale their ability to innovate, create, and bring more content to market. This transformation however starts somewhere else; it starts with the most critical piece, which is the users or consumers of services. With the ever-increasing granularity of data, quality, volume and size of content consumed by an enormous number of users and devices, new customer needs and demands are emerging, and we recognize the massive amount of options and choices available to our customers today. Shouldered on top of Microsoft’s global network, Azure seeks to provide the fastest and most optimized connectivity and delivery options to our customers for all parts of the media production and delivery workflow. Last year, driven by customers’ demand and their passion for pushing more data to Azure, we launched ExpressRoute Direct into preview in the fall of last year. Now generally available, ExpressRoute Direct provides 100 Gbps connectivity, which is the first service of its scale in public cloud and focuses on core scenarios around large data-ingestion, R&D, media services, graphics and the like. Similarly, and also generally available today, we announced ExpressRoute Global Reach, extending the use of ExpressRoute from on-premises or from your corporate datacenter to Azure, to now also provide connectivity between on-premises sites, using the Microsoft Global network. Building new or extending existing ExpressRoute solutions with Direct and Global Reach, is a fast and flexible way to support multi-site collaboration centered around services, data and content stored in Azure. It is also a new option to complement your existing connectivity/WAN/MPLS provider as a backup solution or provide the primary path where your service provider may not have the reach to deliver services locally. At the same time, driven by our customers’ needs to drive rich, online application experiences, we launched the Azure Front Door Service into preview. Now generally available, Azure Front Door extends use of the global service that enables Microsoft’s global brands like Office 365, Bing, Teams, Azure DevOps and Xbox to build high performance, high availability, secure web applications. Now with Web Application Firewall (WAF) capabilities in public preview, Azure Front Door accelerates and secures your applications at the edge of Microsoft’s Global network. “Electrolux is a global conglomerate of brands, selling more than 60 million products across 150 markets. Azure Front Door has enabled us to easily scale our service architecture and APIs to all our global developers and partners in the Wellbeing category. These new, innovative services enable you to quickly accelerate and optimize your end-to-end workflow in Azure. Get started with these new services and the rest of Azure’s networking portfolio today and look for more new services coming soon. I encourage you to watch our newest video on hybrid networking options with Azure, as well as additional details and links to resources. Watch the video, "Hybrid networking in Microsoft Azure" for an architectural overview and demo of hybrid connectivity options in Azure. Putting a rich platform of infra and app services on top of a world-class global network (WAN) with the ability to connect, ingest, store and collaborate across shared data and content assets, makes a premiere toolbox for building and delivering modern applications and content. 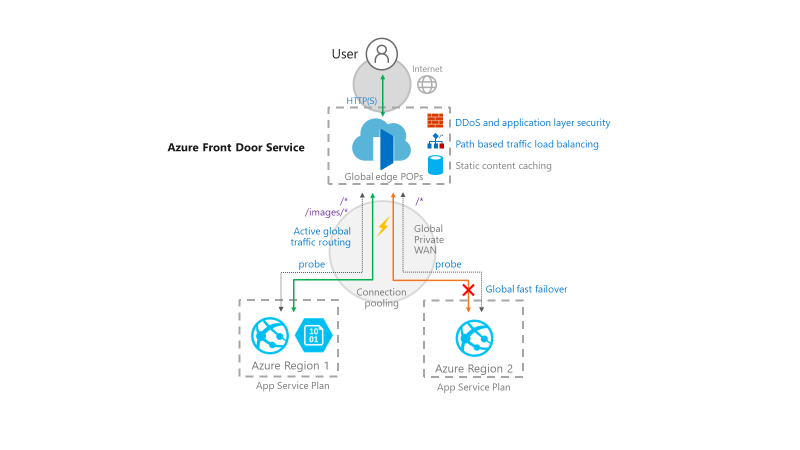 Azure Front Door Service (AFD), the newest member of our application delivery portfolio, is now generally available. Since we launched this sophisticated tool in preview to customers last year, the interest and feedback have been amazing. AFD enables customers to build applications that are truly global by ensuring fast, always-on and secure delivery of your web applications to services inside or outside of Azure. It provides a one stop solution for website acceleration, global HTTP/HTTPS load balancing, API fronting, SSL offload and now also WAF running at the edge of Microsoft’s global network. Improving customers’ application experiences and quality with Azure Front Door can dramatically influence end user behavior. Today in preview, we are enabling a new and fully integrated web application firewall (WAF) with Azure Front Door. WAF at the edge, gives customers total control on access to media and applications. Customers can protect their web application from multiple attack vectors such as volumetric denial of service and targeted application exploits, by inspecting each incoming request at Azure’s network edge before they reach their service’s region. WAF with Azure Front Door enables tuning access to web application using both custom rules in addition to turning on a collection of security rules, managed by Microsoft, against common web application vulnerabilities. We also allow a centralized security policy management that instantaneously propagating any changes you make to all the Front Door edges. Launching AFD to enable our customers to build world-class web applications, is another great example of an enterprise grade service, battle-tested by years of constant support to Microsoft’s biggest businesses like Bing, Office 365, Xbox Live, MSN, and Azure DevOps, proving its mettle to deal with massive scale and high availability for business-critical applications. Get started with Azure Front Door Service for commerce sites, API routing, global websites, cloud migration scenarios. Learn more about the AFD announcement. Azure CDN offers a true multi-CDN experience to deliver content to global or regional audiences, featuring 3 world class networks from Microsoft, Verizon and Akamai. The unified platform, APIs, support and billing experience enables easy, fast setup and management of multiple CDN networks all in one place. Deep integration with Azure enables optimized experiences with Azure services and provides benefits whether your content is hosted in Azure or anywhere else. To further meet the increasing complexity of our customers CDN needs we’re excited to announce two new features of Azure CDN; root domain support and CDN managed certificates for Azure CDN from Akamai. Through integration with Azure DNS, root domain support is available across all providers in Azure CDN via DNS Alias records. This enables products that are using their root domain for their web sites, experiences or content to deliver that content through Azure CDN. In addition, managed custom domain certificates enable Azure CDN from Akamai customers now to turn on SSL on their custom domain with few clicks. Azure CDN also completely handles certificate management tasks such as procurement and renewal. With these and more upcoming improvements to Azure CDN we’re enabling our customers to customize how they leverage the combined footprint of Microsoft, Verizon, and Akamai to deliver content from our 1300+ (and growing!) points of presence around the world. Find more information on these new features and Azure CDN. Find out more about Azure’s networking services through the links below.